Although they have yet to face each other on the pitch, Cristiano Ronaldo has recorded a significant victory over Lionel Messi. Asked: “Who will have the biggest impact on the Champions League Final?” it was Ronaldo who edged out the Argentine in the Footy Boots debate. When polling closed on Wednesday morning, nearly 4,000 of you had voted in just 5 days with the split favouring the Ronaldo / Nike combo. The Manchester United player scored 2,081 votes for 53% of the total with Messi & adidas on 1,875 votes for 47%. Although close, it’s a ringing endorsement for Ronaldo who will of course be wearing the Nike Superfly as opposed to Messi in his brand new adidas F50i’s. Though, with all the drama the competition has generated so far, I doubt the result in Rome will be so clear cut, or indeed, a simple shoot out between the Nike & adidas poster boys. Reports suggest that a number of VIP’s were caught up in long delays at Rome’s Fiumicino airport last night as the authrorities struggled to cope with the influx of fans. If this is the only blip supporters have to endure over the next 24 hours or so, then we can all be thankful. Uefa has been warned by many outside parties that the Italian capital, with its long history of football related violence, was a risky choice to host the final. Let’s hope that all fans, Spanish and English, enjoy a safe stay in the city and peaceful time in the stadium. God forbid they don’t, then we’ll know who to blame won’t we? 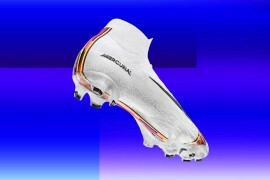 It’s going to be fascinating to see all the new football boots on display in the final. Messi in his adidas F50i’s, Henry and Giggs in the Reebok Instante, Carrick in his newly personalized Puma King’s along with Eto’o possibly wearing a gold version of the Puma v1.08. However, the new gear on show won’t just be limited to boots. Both sets of teams will take to the field wearing the Limited Edition Eugene Track Jackets produced by Nike. 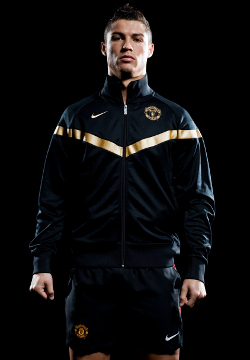 The jacket, being shown here by United’s Cristiano Ronaldo and brought to you exclusively by Footy Boots, is part of Nike’s' Sportswear Icon’s range and will go on sale at the start of next season. Should it come down to penalties, and let’s hope that’s not to be the case, then United should certainly have the edge. 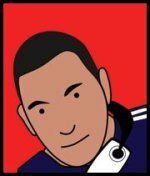 The English side are shoot-out regulars and have won 4 out of the 5 penalty competitions they’ve contested since defeating Chelsea in last year’s CL final. By comparison, Barcelona haven’t been involved in spot-kicks to decide a match for over 11 years. Barcelona havenĂÂ˘Ă˘â€šÂ¬Ă˘â€žÂ˘t been involved in spot-kicks to decide a match for over 11 years because they always go for the win and that sometimes can cost them the match, which hopefully will not be the case tonight. That’s implying United don’t go for the win, which is stupid. You don’t win by not going for the win. 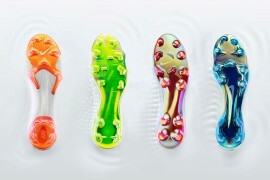 Barca won, Messi triumphed over C-Ron, Adidas/Puma edged out nike.